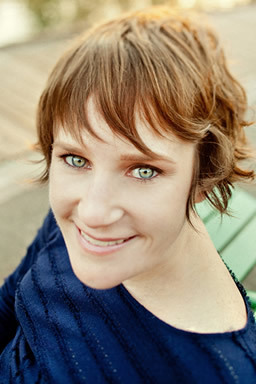 Author of books for children and tweens. Hi! I’m Brandi Dougherty. I grew up in Kalispell, Montana. Do you know where that is? Probably not – it’s a little small! Well, it’s tucked into the Northwest corner of Montana pretty close to Canada. Quick, go get a map and look it up! (I’ll wait.). Find it? Good. What you probably can’t see on the map is that it’s a very beautiful place full of lush green pine trees and craggy blue mountains (the Rocky Mountains to be precise). The mountains create a ring around a dusty valley and that’s where my town is. 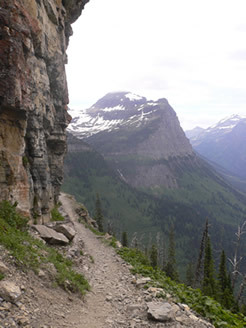 Here’s a picture from Glacier National Park, which is just a few miles from Kalispell. Pretty, right? If you ever have the chance you should definitely go there! 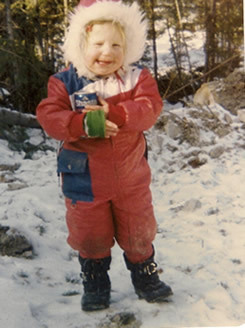 And here’s a picture of me stomping around in the snowy mountains when I was four. So, you may wonder how or why I became an author. Well, I didn’t know for sure that I wanted to be a writer for a very long time. When I was in elementary school I was positive I was going to be a cowgirl when I grew up. Then when I was in middle school I decided I was either going to be a veterinarian, an astronaut, or a teacher. But, I’d always loved making up stories. I think my parents knew I’d be a writer. We’d come up with funny names or titles for things that happened and they’d say, “that’s the title for your first book!” They’ve always been very supportive of me, which is pretty great. I loved to read in middle school. I couldn’t get enough of Beverly Cleary and Judy Blume. And I was a huge Babysitter’s Club fan in fourth grade. I think being a good reader is the most important key to being a good writer. After I graduated from high school, I went to Linfield College in McMinnville, Oregon. Like Kalispell, McMinnville is a small town. But this town is near the ocean instead of the mountains. After taking a few education classes I decided that being an English major was the right choice for me. Then I spent the rest of college reading books and writing papers. I loved it! When I graduated from college I was ready for a little adventure so I moved to the east coast without ever even having visited before! I yearned for the big city life and the experience of being somewhere that is so different from where I grew up. 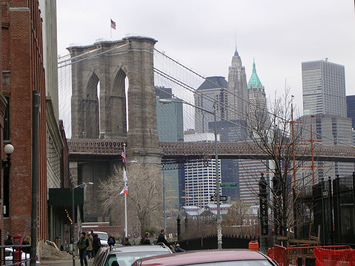 So I spent two years in Providence, Rhode Island and then I moved to New York City where I lived and worked for many years. And New York City is very different from Kalispell, Montana, let me tell you! Here’s one of my favorite pictures that I’ve taken of New York City. It was in New York that I decided to start writing children’s books. I was lucky to have a lot of help from friends and coworkers to start making this dream a reality. And now I live on the west coast enjoying a little sun (most of the time A LOT of sun) in Los Angeles! I have always written about what I know: my relationship with my sister, struggles with friends in middle school, feeling too little and shy when I was really young. These are some of the things that help shape and define who I am and I love remembering these different times in my life through writing. Other than that, I like to travel with my husband, Joe, try different kinds of foods (especially different kinds of tacos! ), and spend time with our sweet son, Oslo, our adorable daughter, Charlie, and our crazy dog, Jerome. 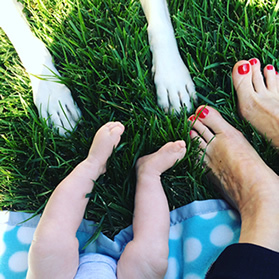 Here’s me, Oslo, and Jerome (before baby Charlie was born) enjoying a little LA sun in our backyard. Thanks for stopping by! And don’t forget to check out my Books page to learn more about what I’ve written.